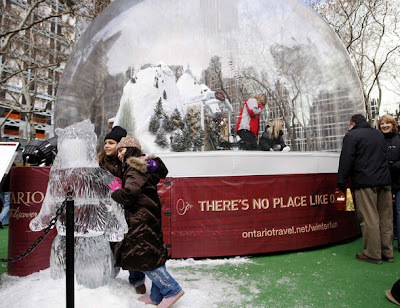 Children pose for photographs in front of a giant snow globe promoting tourism for the Canadian province of Ontario, in Bryant Park, New York. Tourism officials call the snow globe the world's largest, but they haven't made it official, said Mr. Wahlberg, the owner of the company that created the globe. He submitted the globe to Guinness World Records, but was told it would have to be a "true replica" to claim the title. One problem: It's not filled with water, like the hand-held versions.